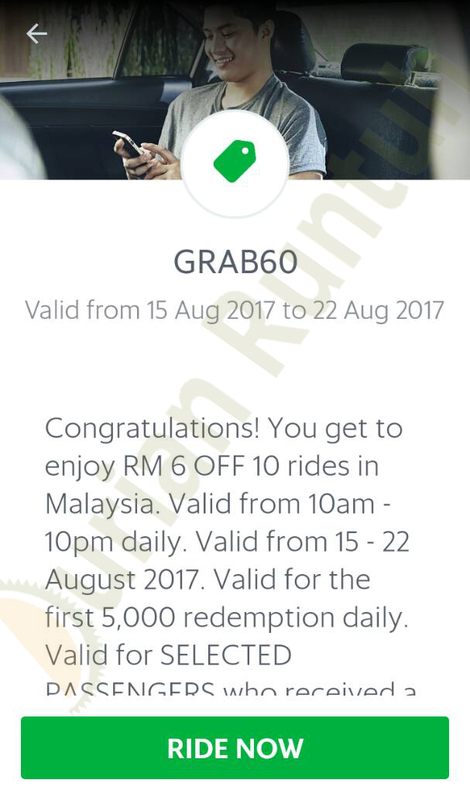 You get to enjoy RM6 OFF 10 rides in Malaysia. Valid from 15 - 22 August 2016. Valid for the first 5,000 redemption daily. Valid for SELECTED PASSENGERS who received a notification from Grab. You get to enjoy RM8 OFF 8 rides in Malaysia. Valid from 15 - 22 August 2016. Valid for the first 5,000 redemption daily. Valid for targeted users who received a notification from Grab.